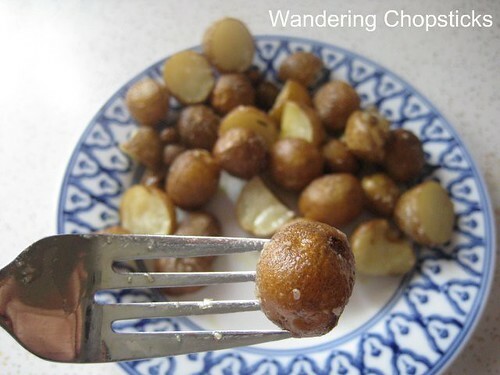 Wandering Chopsticks: Vietnamese Food, Recipes, and More: Sprouting Potatoes? 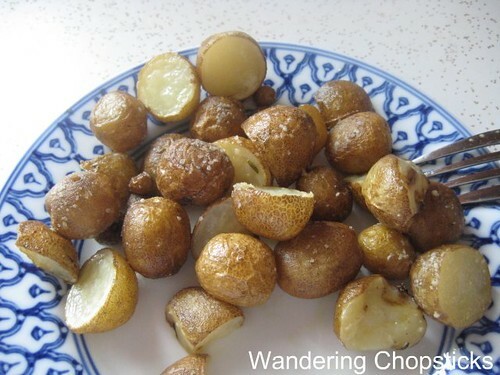 Homegrown Fingerling Potatoes! Sprouting Potatoes? Homegrown Fingerling Potatoes! I had some potatoes that had sprouted after I had forgotten about them. 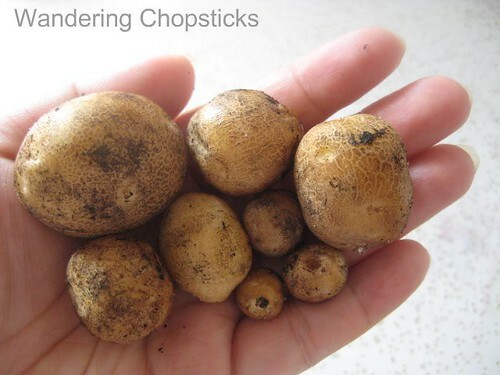 Instead of tossing them into my compost bin, I remembered a post from last fall when Zoey of Perennial Passion planted sprouted potatoes and got a mini-harvest of baby potatoes. So that's what I decided to do. I just had plain old russets. 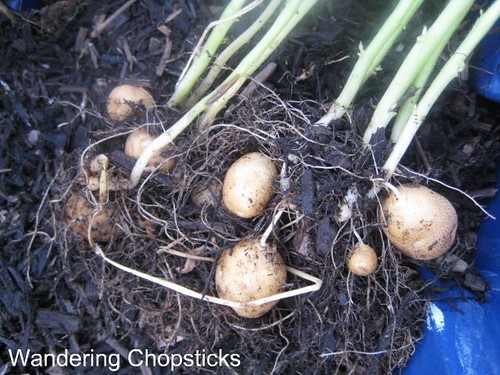 The sprouted potatoes on June 7. I cut them up into quarters. 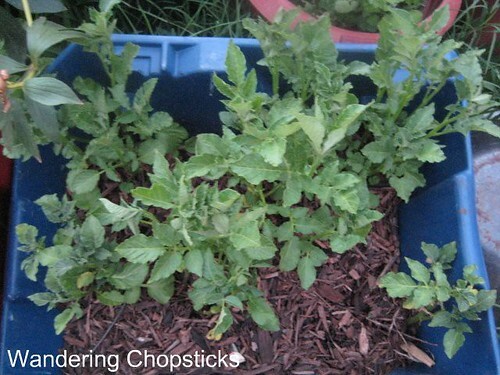 And planted them into a plastic container of wood mulch. By June 16, they were already starting to show some green. On July 1, the potato greens were looking pretty healthy. I pulled one up and all I saw were roots. The potatoes aren't ready to harvest until the greens start wilting and the potato itself is no longer getting nutrients from the leaves. August 14, the greens had almost all turned brown so I pulled up some and found baby potatoes. Yippee! 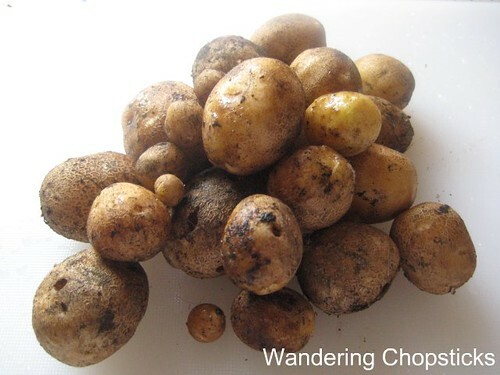 Fingerling potatoes in just two months! This was my entire harvest from those five potatoes. Here, so you can see how small those potatoes really are. I cleaned them up and simply roasted them with salt, olive oil, and rosemary. Delicious! 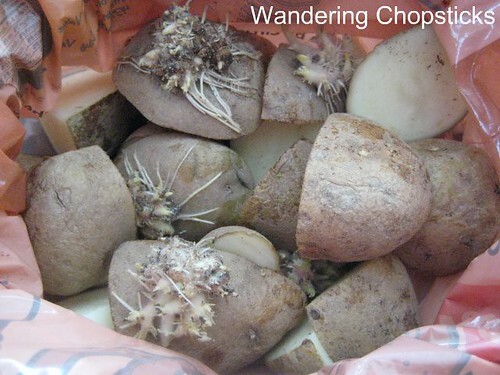 So next time you've got potatoes that have sprouted, don't throw them away. Plant them! Who else grew their own potatoes? Zoey of Perennial Passion gave me the initial idea. Vicki of A Work in Progress got an even tinier handful. 1 year ago today, 4 of 7 random things about me meme: I own two woks and show you How to Season a Wok. I am heading to supermarket this weekend to get some potato to allow it to sprout. I love your gardening posts so much. Oh yah, any tips for growing asparagus? Wow, just wood mulch in a plastic bin? How often did you water? I wonder if I could do it in some straw. I've got a couple of bales and also lots of plastic bins. Cool! I am so glad I inspired you. Very cool. I will have to try this. Thing is, fall is coming, so it will have to be next year, I think. That is so cool! What a great idea! I always have old potatoes around. I'm going to have to try this. Great harvest! Thanks for passing the idea along. I usually avoid growing potatoes because I hate digging them up. I love that you just had to tug them out of the mulch. this is so awesome! i wonder if i could sneak a rubbermaid bin outside my apartment building and grow some. Hard to believe something that mouth-watering came from something that looked as though it had a bearded Squid birthing through its skin. Here I've been stupidly cutting that part away and eating LESS potato. I should of planted them and reaped the reward! I'll be doing that from now on. That is so exciting! You must feel so satisfied. I will definitely give this a try. 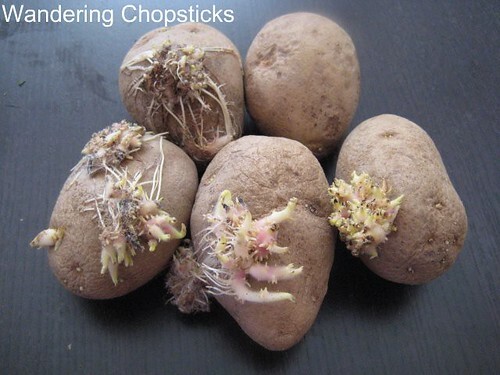 This is too cool. . .I've thrown many a potato away because they've sprouted. What a waste, eh? I could have been planting them instead. Thanks! I'm going to try this and see how it goes. Oh my goodness! How serendipitous - I got some really amazing purple potatoes (which I've never, ever seen at the market here before) a couple of weeks ago and when I went to cook them last night they'd gone all sprouty... I wanted to cry. That is very interesting! I never knew you could do that...and even after you cut it it still grew. Very cool. Great idea and photos! Hooray for baby potatoes! I'm hoping to experiment with different varieties next year - wouldn't homegrown purple potatoes be awesome? I've never tried growing asparagus so have no clue! Glad you're enjoying the gardening posts. I watered every day or every other day when I watered the rest of my pots. The LA Times recently did a story on no-dig gardens using hay bales. You can search for it. Just make little holes and put your seeds in there. The hay retains more water so you'd actually water even less. I used wood mulch so they'd be less dirty. I hope you try. Two months and Florida weather should be just as good as SoCal weather for growing during "winter." 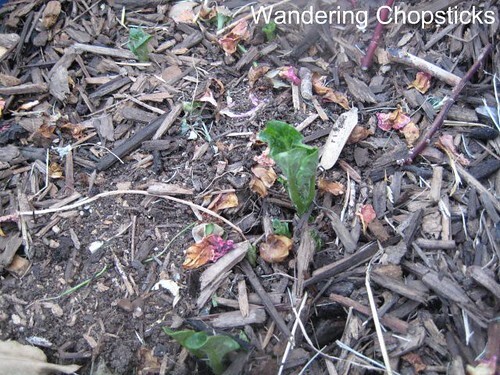 They're a little dirtier than I expected, but yeah, I used wood mulch hoping there would be less dirt on the potatoes. I used a discarded old recycling container so I don't see why not? Bearded squid?! Haha! Potatoes are pretty gross looking when they start sprouting. Gotta be careful. I've heard eating green potatoes can be toxic! I did feel like quite a farmer. Although if I were a real farmer, it'd be a pretty pathetic crop. I've thrown many potatoes out before too. But this time around, I had just potted some flowers and had the mulch and bin on hand. Oh yes, I should definitely try this again with purple potatoes. They're just so pretty, why didn't I think of that? Well, I cut them where the different eyes sprouted so they didn't all run into each other. Then each sprouted part grew into a separate potato. I've done similar roasting recently and I agree, delicious! I used to cut off the greens until I read recently that they were toxic! Scary I didn't get sick before. Wow, I knew potatoes were easy to grow, but I didn't know they were THAT easy. What a great little project! I was surprised to get get baby potatoes in just two months too! That they did! And these are perfect for you to grow in containers. They're so cute! I can't wait to have my own garden to grow stuff too. Start with containers. It's always nice to be able to grow something.